The Special Collections team has been joined for the last couple of weeks by Claire Preval, an undergraduate intern from the Department of the History of Art and Film. Claire spent her first few days doing a great job of sorting our extensive collection of foreign language editions of works by Sue Townsend and has written the following guest blog post about the collection. One of the wonderful things about the library’s Sue Townsend collection is the variety of ways different cultures and eras have designed the books. While the old cliché dictates to not judge a book by its cover, it is a high priority during publication to have an appealing cover to attract browsing customers. Some people, like me, have never read the written life of Adrian Mole by Sue Townsend, but to see an interesting cover in a library or bookshop can be enough to grab the attention and pique interest. Having had the opportunity to sort through some of the collection of Mole books has provided me with the chance to see some of the different cover designs, and to look at how different countries have interpreted the character. When the books were published in the UK during the 80s with illustrations by Caroline Holden, it was agreed that the characters themselves would not be pictured. Instead illustrations of places and objects mentioned in the book would be included, so readers could see what Adrian was interacting with and feel further drawn into the story, without having their own mental image of him being influenced. On the other hand, one of the books, written in Basque, shows a scruffy school boy slouching on his chair, surrounded by the mess in his bedroom. 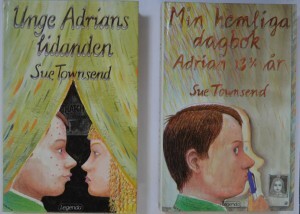 A couple of the Swedish covers show the half portrait of a particularly spotty young teenager. These completely contrast with the illustration on a Chinese cover which shows a well-dressed young boy with tidy, side-swept hair. The development in popular design through the years is also present, with many books using harsh photomontage effects that were particularly popular in the 1980s-early 90s. 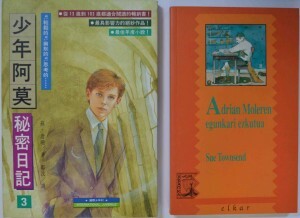 Most of the books are illustrated in order to appeal to a young audience, though there are some photographic covers, possibly an effort to appeal to adults, though cleverly, they also reflect the change in Adrian’s life as photography is used more on the covers where Adrian has grown from a boy, aged 13 and ¾, into a man. While I have not gone through the entire collection I have already sorted around 30 languages. Who would have thought an unassuming teenage boy from Leicester would captivate so many different countries! One of the books that particularly stood out to me is written in English – with the exception of the blurb and comments typed in the margins translating certain words, which are all Norwegian. I imagine it is to aid Norwegians in learning to read English, but I’ve only ever seen textbooks take such an approach, never a fiction book. 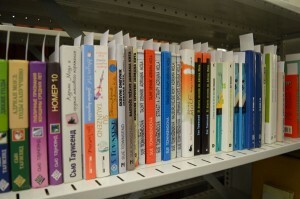 It will be great when the collection is completely sorted, with some of the books in English (US), French, Italian, German and Spanish being available on the normal library shelves to help in language development. I can’t imagine there to be a particularly high demand for the Icelandic translation but it will be convenient to have the collection available and easily navigated for when the day comes.